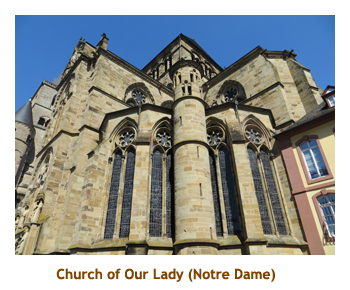 This cruise was the 3rd leg of a larger trip that also included a Rhone River cruise and a land stay in France and Belgium. 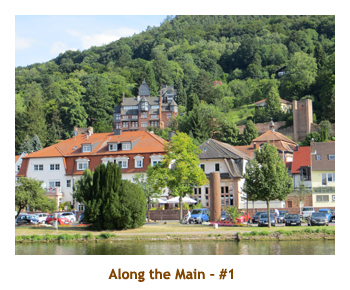 When we were looking at river cruises, Marjorie noticed an AMA Waterways cruise that had good T/A rates. 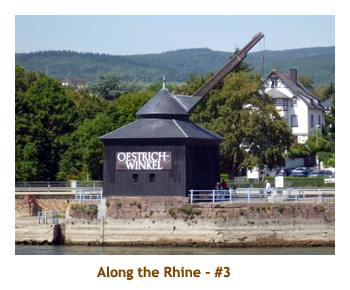 It repeated a section of the Rhine River that we had done twice before, but included some new ports as well as a major portion of the Mosel River. 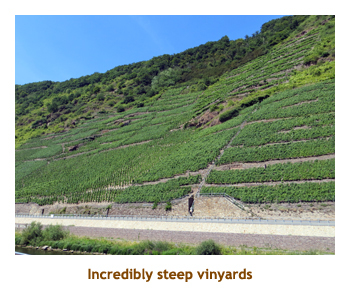 We had never done the Mosel before. 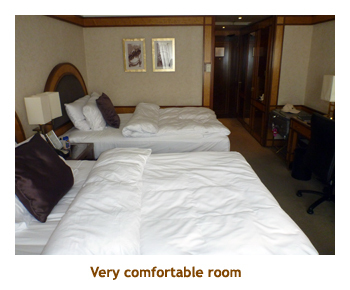 I should explain the 4 star ratings versus the 5 star ratings of the Uniworld cruise. 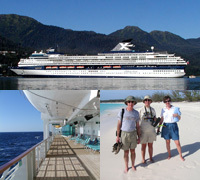 We found the Uniworld cruise to be a touch better in all areas, although it was also more expensive. 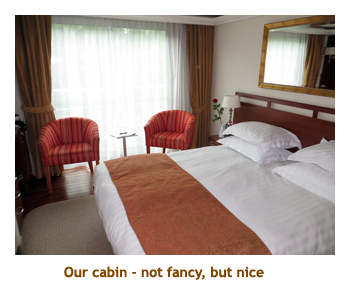 The AMA ship was a notch down from Uniworld in both cabin size and overall decor. But, if you're not into "fancy", both are very nice. 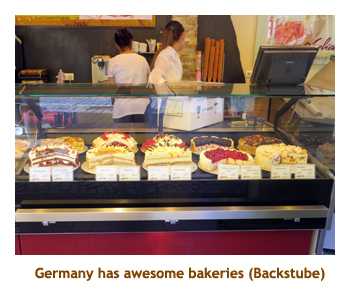 In the area of food, both were excellent, although Uniworld seemed to have more variety. The down grading of AMA for food comes from the included liquor package. It was only served in the dining room at lunch and dinner. On Uniworld liquor was included anywhere and anytime, with more variety of available drinks and brands. The wait staff on Uniworld seemed a little more attentive and did "above and beyond" things gladly. 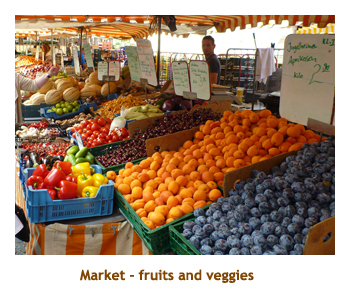 And finally the itinerary on AMA was too busy, hitting two or even three towns on the same day. We sometimes felt rushed in town, having to get back for the sailing to the next town. 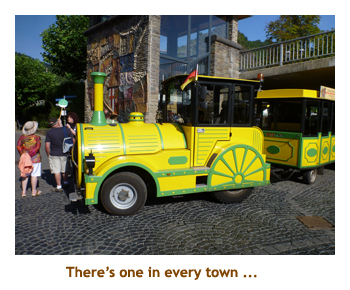 Better to spend more time in each town and do fewer of them. Once again the cruise was not full - only 129 passengers with room for 146 total. Good for us, though, looking for T/A rates. As before, we met a number of T/A's on the cruise. In contrast to the Rhone cruise, temperatures were in the high teens / low 20's each day (until the last couple of days) with a mix of cloud and sun. 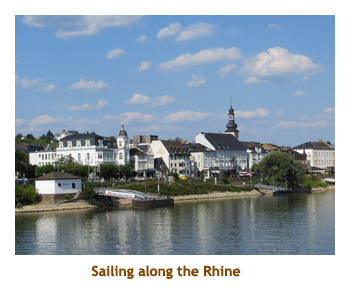 The first half of the cruise was on the Main/Rhine rivers, while the second half was on the Mosel. 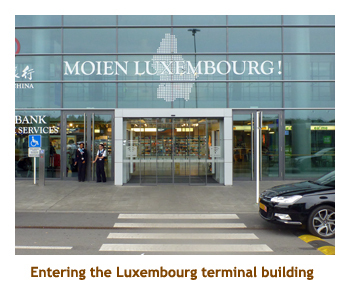 We left off the previous diary having walked in the rain to the Brussels Central train station, around 5:00 PM. There we purchased tickets to the airport via city transit. The train was almost empty which was great for storing our luggage. It was maybe 4 stops and then we were at the airport. We located the Czech Air checkin (or Czech-in) desk and got rid of our checked (or Czech'ed) luggage. We found a fast food outlet where I had a meat pie and a Coke. We did security and waited for our 8:00 PM flight to Prague. 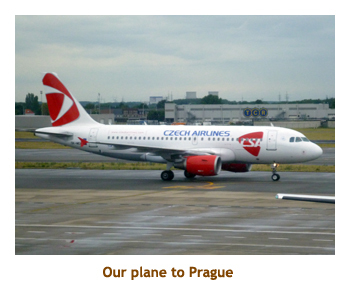 The flight was ontime and we landed in Prague. Our hotel there was the Intercontinental and was part of the cruise package. Marjorie had arranged for the hotel to pick us up at the airport and sure enough there was a driver waiting for us. It was quite a drive into the city. We were dropped of at the hotel about 10:00 PM and checked in. We located the Ama Waterways desk in the lobby, grabbed an information sheet covering the next day's events and then headed up to our very nice hotel room for a good sleep. We woke up about 7:00 and had an excellent (included) breakfast at the hotel. 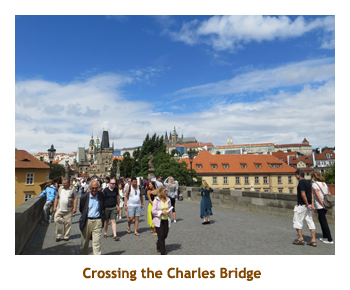 This morning (9:00 AM) we were doing a walking tour of the Prague castle area and the Charles Bridge area. We had done this tour before on a previous river cruise. 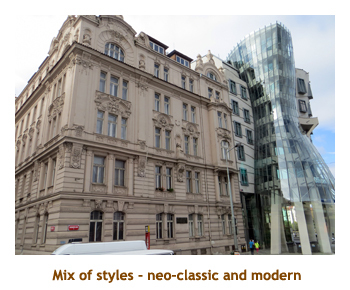 The bus ride to the start of the walking tour was very interesting, passing through the more modern part of the city. 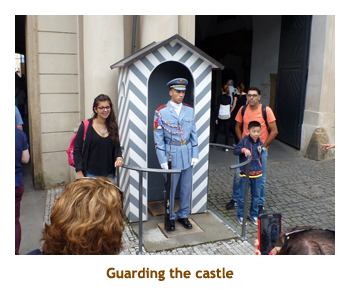 We got out of the bus at the castle and wandered through the main plaza. 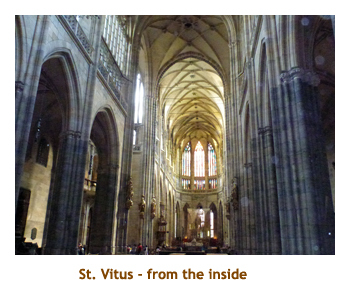 We were given time to enter the St. Vitus Cathedral, but could only view the inside from the entrance area. Then we headed down the hill towards the bridge. 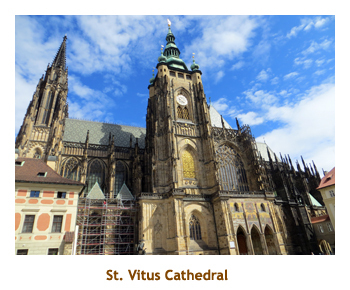 (The previous time we had a much better tour of the castle area, with unlimited access to the church, a tour through the Vladislav Hall, and a walk down the "Golden Lane" houses). 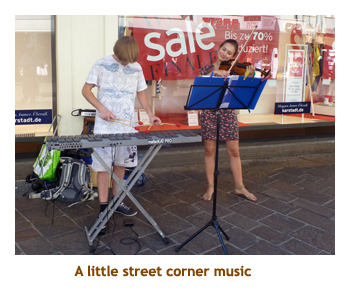 There were lots of musical buskers around, and I think we had seen one or two of the groups from before. Whatever, they were all quality musicians. The bridge was crowded as usual and we did a slow walk across it. 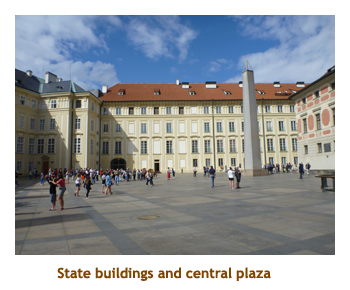 We then walked from the bridge to the main plaza and finished up at the astronomical clock. We were left to wander around the old town and make our own way back to the hotel. We decided to walk to the nearby Municipal Hall where we had attended a wonderful concert three years ago. 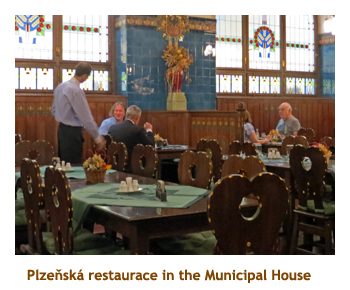 We headed down to the basement level to try out a famous restaurant (Plzenska Restaurace) with the "oldest bar in Prague". We both had schnitzel and really enjoyed it. 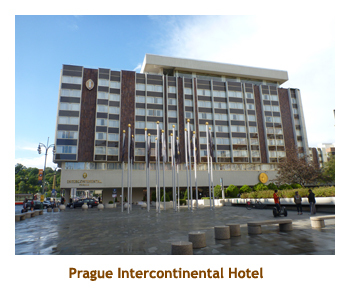 Afterwards we walked a few blocks to the Lidl grocery store, right by the Imperial Hotel where we had stayed before. Along the way we bought some tickets to a small concert happening tonight (6:00 PM) in one of the local churches. Then we continued back to the hotel. It started raining as we approached the hotel and by the time we were in our room it was absolutely pouring (outside, of course). By the time we needed to leave for the concert, the sun had come out again. 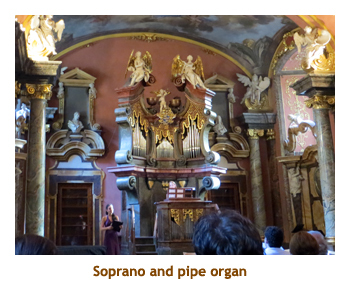 The concert was in a small chaple and consisted of a string quartet, soprano and organist. 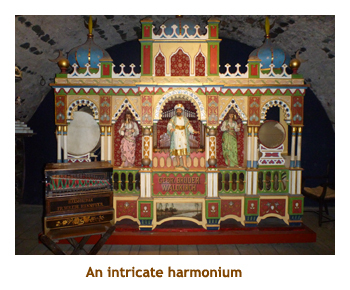 The works were baroque nuggets that featured various combinations of the musical instruments and voice. It was excellent. Afterwards we walked back to the hotel and read before bed. We were up early at 6:00 AM, and had our bags out by 6:30. We had breakfast at the hotel and were on the bus by 8:00. 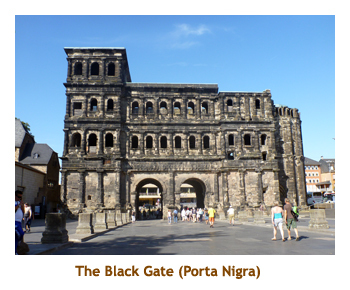 It was a 4 hour drive to Nuremberg. We did a pit stop along the way. 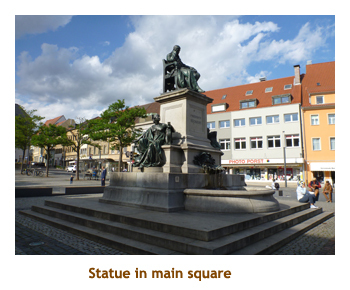 At Nuremberg, we were dropped off in old town to explore and have lunch. We found a really good pizza (and gelato) place. 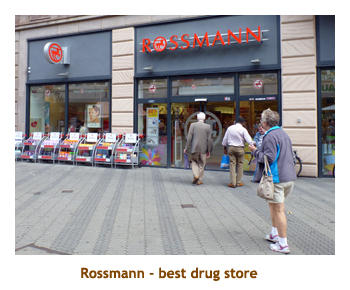 Then we walked to Rossmanns, Marjorie's favorite drug store. 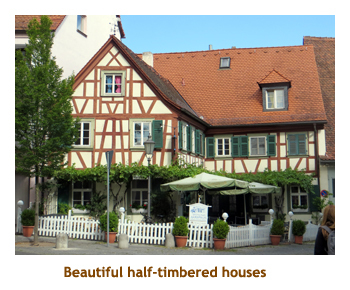 We had been to Nuremberg twice before (once for 3 days), so didn't mind that there wasn't time to really do the old town. 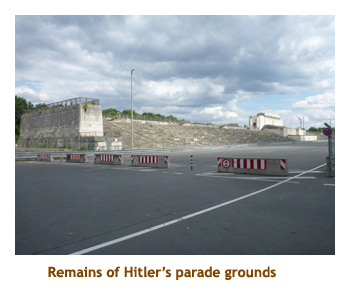 Back on the bus we visited Hitler's headquarters - the parade grounds and documentation center. 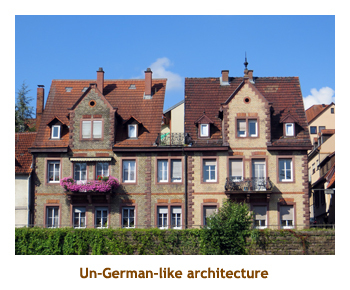 Not much left of either, the German's being torn between obliterating the Nazi years and retaining historic stuff. We were to the cuise dock by 4:00. We checked in, unpacked our luggage, sat through the muster drill and then headed for dinner. I had salmon.We were late leaving (planned 7:30 PM, actual 11:30 PM) due to a lost passenger, so we walked the dock area for a while. Then to bed. Note: The missing passenger was a "continuing" B2B pax who had taken a ship sponsored tour via train to Munich for the day. He somehow got separated from his group, and when taking the train back to Nuremberg, he inadvertantly climbed aboard a train to Salzburg (the wrong direction). 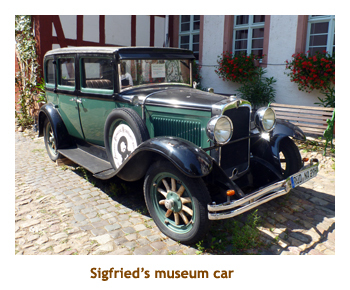 He contacted the ship from Salzburg and had to have a private car drive him back to the ship (2 hours, 600 Euros). We were up at 7:00 to a raw day in Bamberg - a high of 18 (13 right now) and heavy cloud. 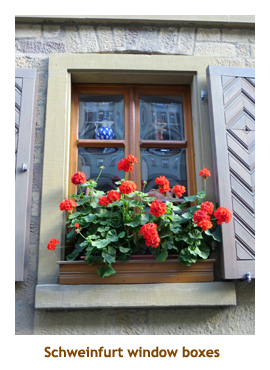 We had done Bamberg twice before, both times in the warm sun, so decided we would stay aboard. We had a leisurely breakfast as we sailed towards Bamberg. We were supposed to be docked by 8:30, but due to our late departure from Nuremberg, it was just after 9:00. The walking tour was planned to leave at 9:00, so they were only late leaving by a few minutes. As soon as the group had left the ship, the crew undocked the ship and we set sail for Hassfurt where we would pick up the walkers (now bus'ers) about 1:15. There were only 8 of us left on the ship so we had a very quiet sail. We wandered throughout the ship and then I visited the gym for a workout. Heavenly! 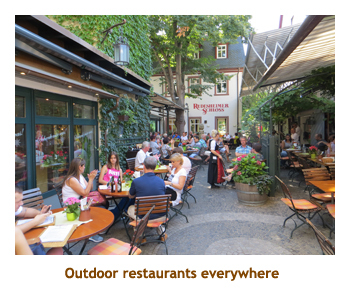 We picked up the group at Hassfurt and then were served a late-ish lunch. It was sunny by the time we were sailing to Schweinfurt. We arrived there at 4:00 PM and immediately struck out on a walking tour of the town led by our cruise director. It was a pretty little town. The CD broke our group into two teams and we tried to pick out the town highlites (based on a printed handout) before she pointed them out. For dinner we had signed up for the chef's table where I had rack of lamb. The table was in a special room away from the maddening crowd. The event was free of charge, and everyone had an opportunity to eat there at least once. After dinner we read for a while and then went to bed. We were up at 6:30 to a sunny day, targeting 20 degrees later in the day. 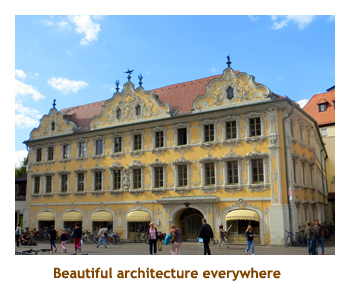 We had breakfast and then headed out on a 9:00 AM walking tour of Kitzingen. 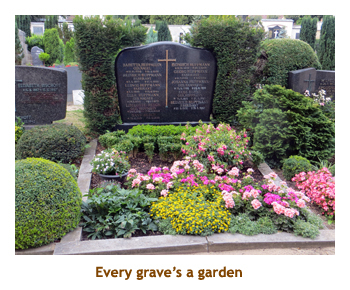 The tour took us around the old town including a beautiful cemetery where every grave marker contained a garden. 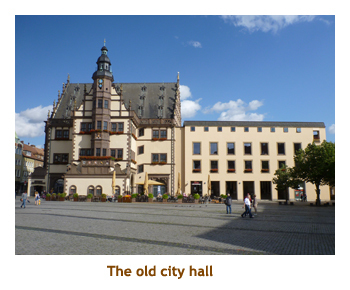 The main square was ringed with ornate buildings. 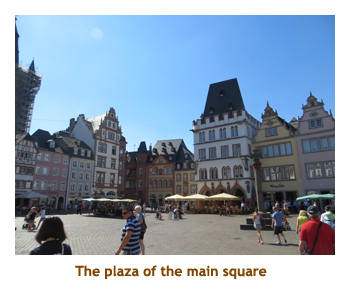 Although we have been to many German towns / villages, the public squares always impress me. The guide expained that the river floods the village every few years and a number of buildings were marked with historic water levels. Scary! We had some time on our own and found a Norma grocery store where we bought some Coke and a couple of packages of Tuc crackers to take back to Calgary. Tucs are my favorite crackers and we can't get them in Canada any more. At 11:00 AM we regrouped in front of a huge underground wine cellar. 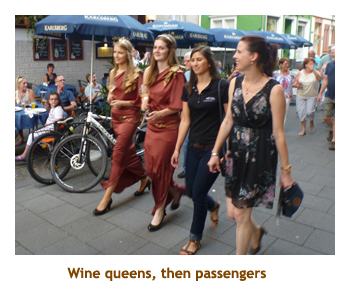 There was a "wine queen" and a Mayor (from the Aulic Council) who welcomed us and explained a little about Kitzingen and the history of the wine industry. Then we popped down some stairs into the cellar where we had a wine tasting. There were rows of tables set up for the tasting and the entire shipload of us fit comfortably in the cavern (shared with many kegs of wine). After the tasting we all trouped back to the ship for an early lunch. Right after lunch we left the ship again for a bus ride to Wurzburg. 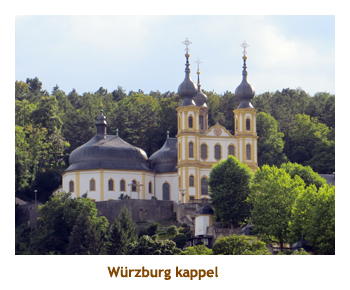 Once again we had been to Wurzburg twice before, but looked forward to seeing it again. 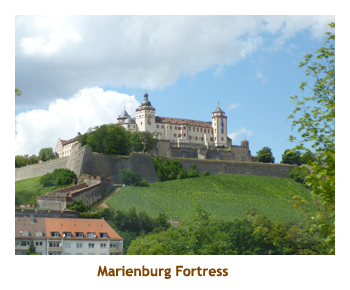 We could tell we were getting close to Wurzburg when we could see the Wurzburg (Marienburg) castle up on the hill and the vinyards leading up to it. 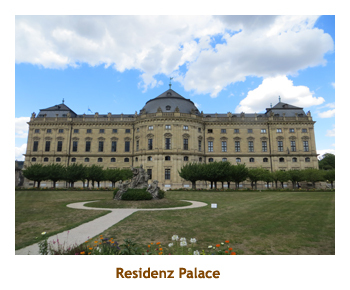 We drove to the Residenz Palace to start our tour. 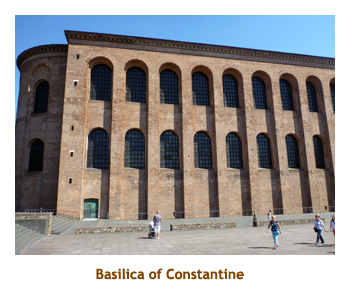 The palace was built for the prince-bishops and is really huge. We did the usual tour through it , admiring the Tiepolo ceiling. 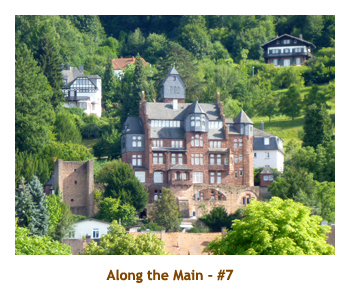 After walking around the surrounding gardens, we hiked downhill by the Marienkappel and town square. It was nice and sunny, so even though I have loads of photos from previous visits, the blue sky made me snap some more. From the town square we wandered to the riverside where our ship would be docking. 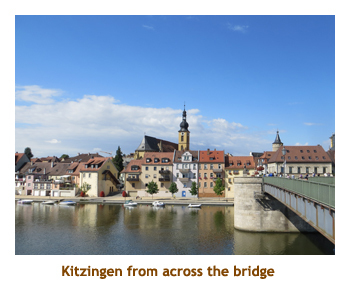 While we had toured Wurzburg the ship was moving from Kitzingen to Wurzburg. 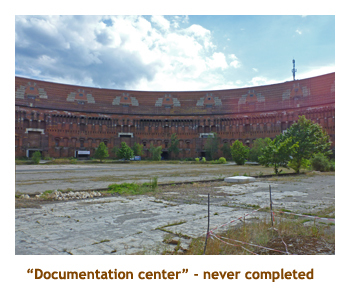 We had beaten the ship here, so had to wait about an hour for it to arrive. For dinner I had pork medallions wrapped in bacon. We had heard that the kitchen would do schnitzel if we asked, and so made a request. The chef said he would make it for us at lunch tomorrow (just Marjorie and me). For the evening entertainment a glassblower had come onboard and demonstrated making various glass objects. He had a hilarious running commentary as he worked. We woke up at 6:30 to another sunny day. 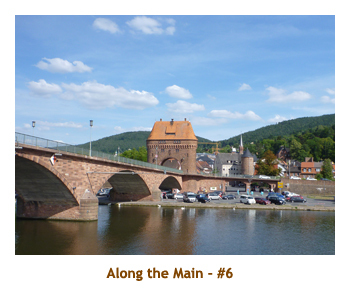 Today we would be in Wertheim for the morning and cruising the Main River valley in the afternoon. 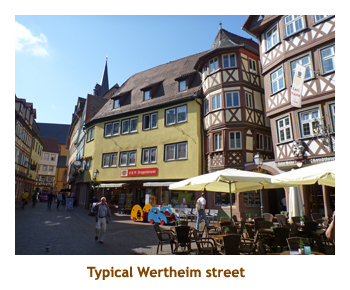 We had breakfast and then headed on out a 9:00 Wertheim walking tour. 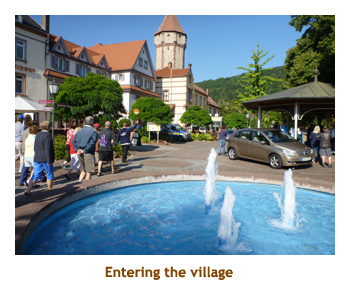 Wertheim is a small village of about 24,000 people. 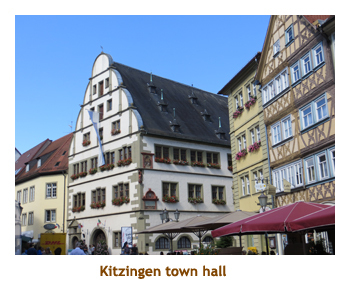 Like Kitzingen, this village floods every few years as well. I guess they are used to it. 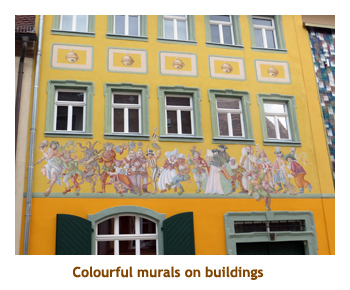 A number of buildings had markers of past flood levels. We were given a guided tour for about an hour and then had some time on our own. 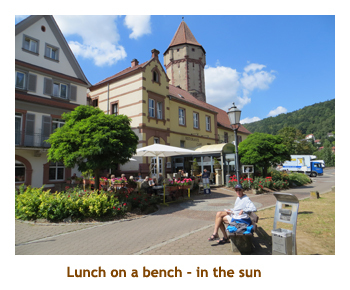 We popped into a bakery and picked up some snacks, and then found a nice bench in the sun to munch away. We were back on the ship in time for our special schnitzel lunch. It was excellent. We were the only ones served schnitzel - it pays to ask! The ship set sail at 1:00 and we were treated to a sunny, blue sky cruise through the Main River valley. 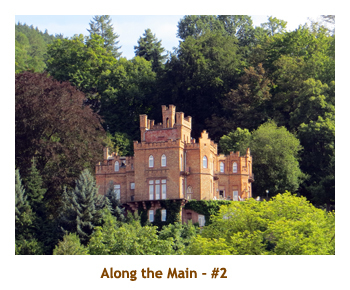 We sat on the upper deck with our drinks, and watched the castles and vinyards roll by. 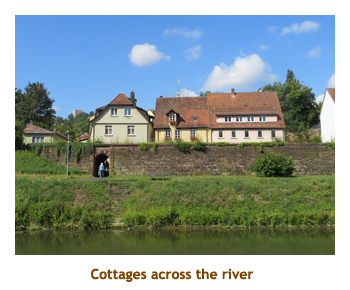 There were lots of small villages along the banks. We were given a map handout of the area showing the location of all the castles, and the cruise director announced each one as well. However, I didn't note which castles I took pictures of so I've long since forgotten. It was a beautiful afternoon. For dinner I had a lamb combo - rack and shank. It was very good. The entertainment was a local band and singer that we had seen twice before on previous cruises. 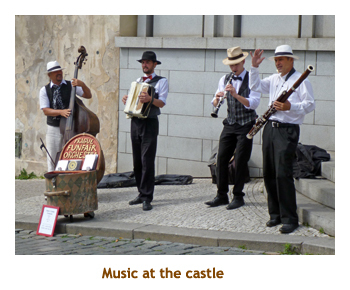 They are an excellent group and play quite a variety of music. This time the clarinet player was missing, but the band still sounded great. We were up at 6:30 to a busy day. It would be warm, with a high of 29 degrees. 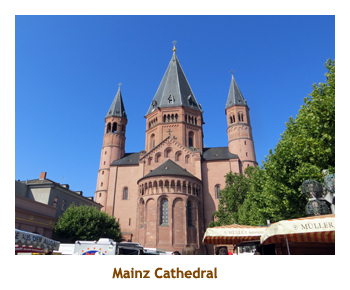 Arriving at Mainz meant we had left the Main River and joined the Rhine River. 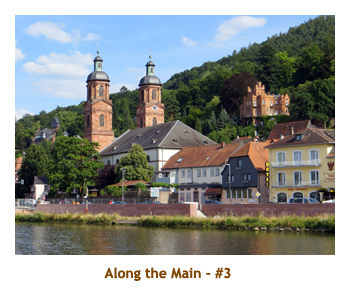 We had two choices for tours today, either half day Mainz and half day Rudesheim, or a full day Heidelberg. We hadn't been to any of these places, so it was a tough decision. 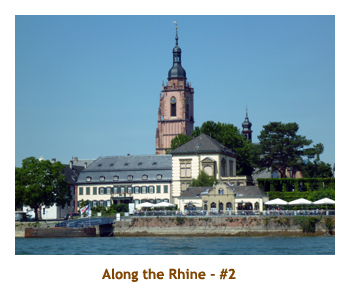 We decided on Mainz and Rudesheim. 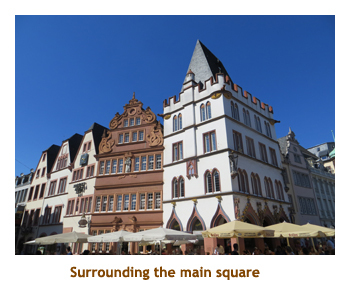 We had breakfast and then headed out at 9:00 on a walking tour of Mainz. At the same time we waved goodbye to the group heading off to Heidelberg. 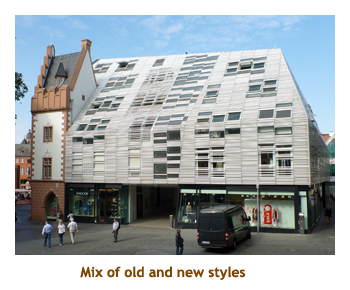 We walked through a bit of modern Mainz and then into the old town. 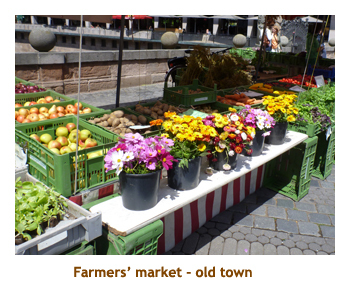 There was a farmer's market in full swing in the town square. 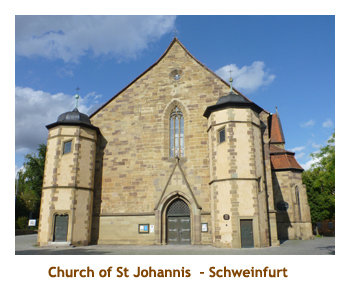 We visited a couple of churches, one Protestant and one Catholic. 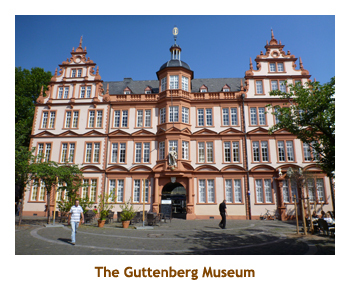 The highlite of the tour was a visit to the Gutenberg Museum. We first viewed two copies of the original Gutenberg Bibles, and then were given a demonstration of early typesetting and printing techniques. 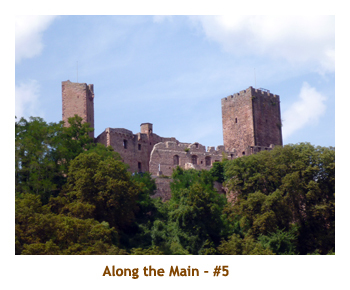 We were back to the ship by 12:00 and had lunch as the ship sailed for Rudesheim. 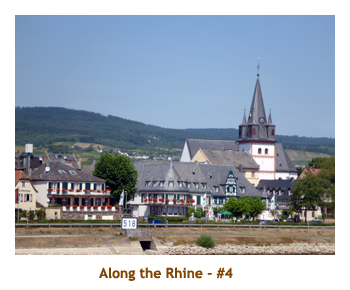 We were soon in Rudesheim. 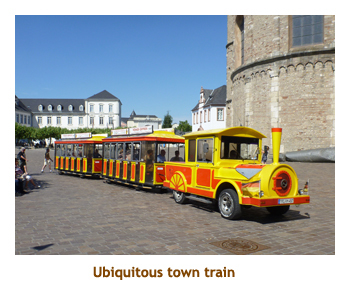 The town was built up a hill, so a tourist train was there to drive us up to the top of the town, specifically to Siegfried's Mechanisches Musikkabinett (Mechanical Music Cabinet) Museum. 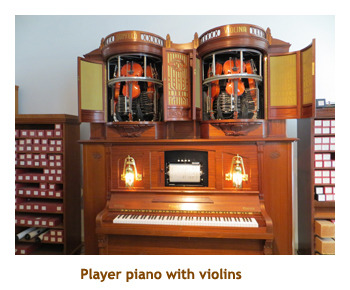 We were toured through the building and the various mechanical instruments were demo'ed for us. 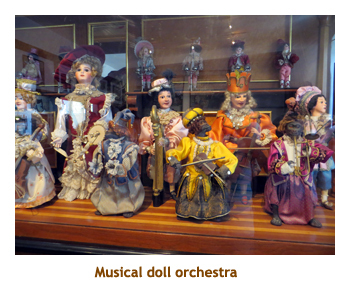 There were lots of piano-like instruments, as well as animals, puppets and dolls playing different instruments. It was really interesting. After leaving the museum, we were given an hour to wind back down through the streets and find the ship below. The town was very touristy and quite crowded. We were back aboard the ship around 4:00 when the Heidelberg group returned from their all day tour. With everyone back on board, we set sail for Koblenz. We had a couple of hours of viewing the Rhine gorge from the upper deck. 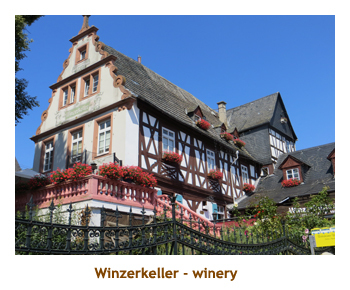 Once again we passed villages and vinyards sparkling in the sunshine. It was quite hot after a while. 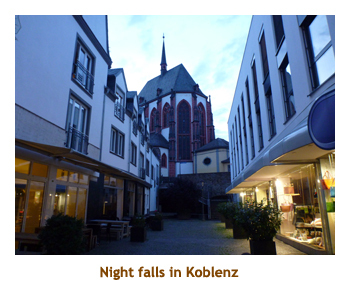 We had an earlier dinner as we were arriving at Koblenz by 8:00 PM. 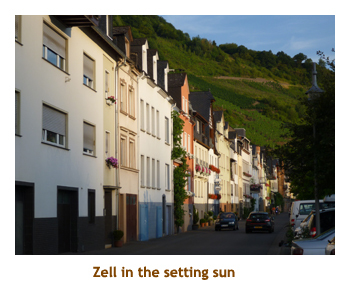 Koblenz is at the junction of the Rhine and the Mosel. 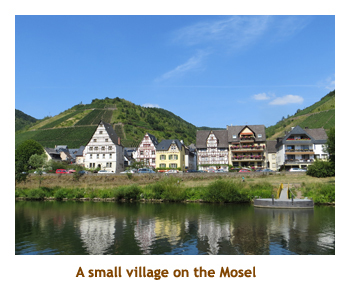 We would be sailing up the Mosel for the remainder of the cruise, so all new territory for us. 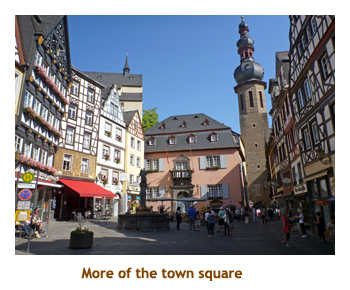 After dinner we docked in Koblenz and headed off on a one hour walking tour of the town. It was 9:00 PM and starting to get dark, so I didn't take many pictures. 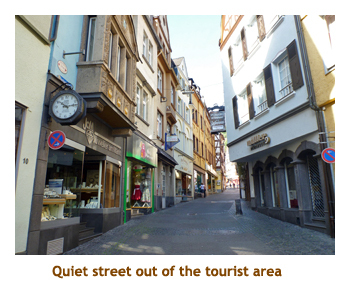 We had been in Koblenz on a previous cruise (during the day time) and had a much more intensive tour of the town. This time we needed to get back to the ship before dark. Back aboard ship we called it a day and went to bed. We woke up today to another awesome forecast - 30 degrees and sunny. 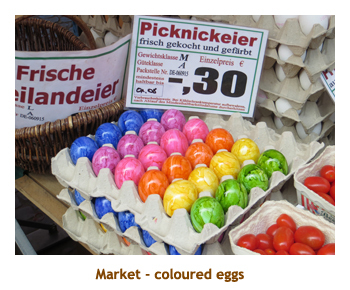 We had breakfast as we arrived in Cochem. 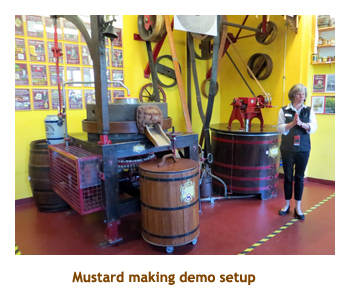 I was booked for a walking tour of the town while Marjorie signed up for a mustard factory demo and tasting. It was only 8 degrees when we headed off on our tours, so people were bundled in sweatshirts and jackets. However, it soon warmed up and these were shed. 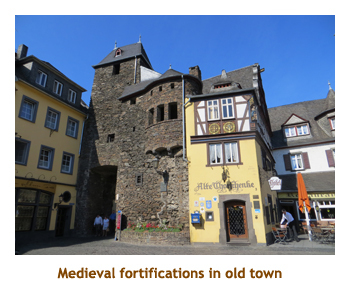 My tour took us across a bridge to the main town and then uphill to the town square. There we were given time on our own to explore the town. 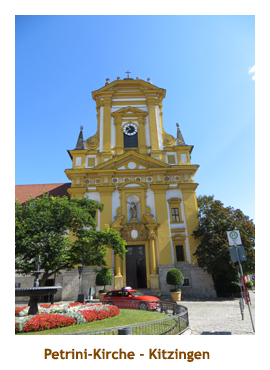 There was the option of taking a bus or walking further uphill to the old castle, but I decided to walk around the town instead. 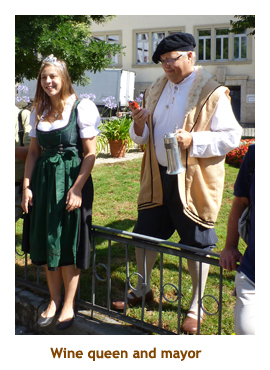 The town was celebrating "burgfest" and a parade up to the fortress was to happen at 11:00. However, it was getting hot so I skipped the parade and headed off to explore part of the town. 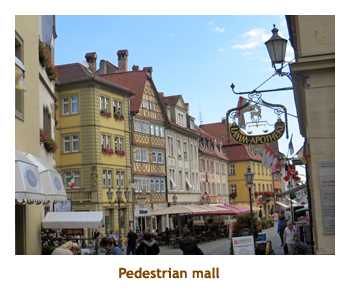 I walked along a street paralleling the river, out of the tourist area, through more modern shopping stores and into a residential area. It was almost deserted there. On the way back I stopped into a deli to get a couple of Cokes to take back onto the ship. Then I walked down to the river. While walking along the river front, there was a terrific bang like a gunshot. I turned around towards the castle and saw a rising cloud of smoke above a cannon. They were firing the cannons! 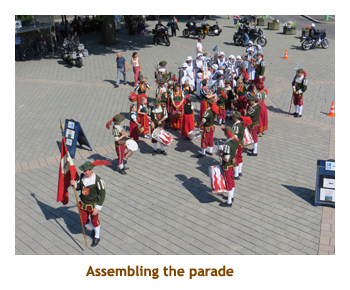 I guess the parade had reached the castle and they were welcomed with cannon fire. There were several more bangs and puffs of smoke. 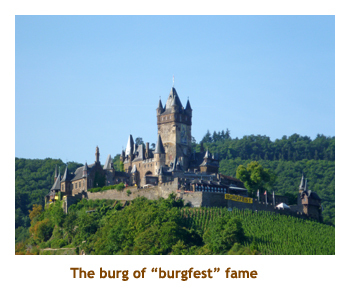 Welcome to burgfest! As I walked across the bridge to the dock side, I ran into Marjorie who had just been photographing the start of the parade. She took me to the mustard museum where we bought a couple of jars of specialty mustards. I learned an interesting fact that the mustard seeds were imported from none other than Canada! I wouldn't have guessed that. Then we wandered back to the ship for lunch. 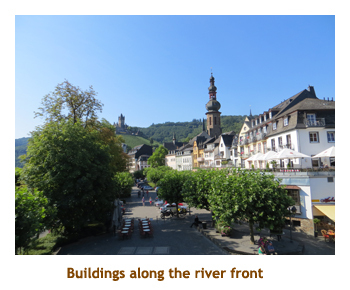 After lunch the ship set sail for Zell and we had a few hours to view more of the Mosel River. 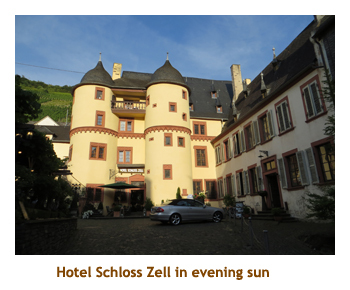 We had another early dinner (wiener schnitzel again, this time for everyone) as we arrived in Zell about 7:00 PM. This was the smallest village of our cruise, at 4,300 people. They had organized a wine tasting for us, with tables set up in the town square. We had had beer and wine with dinner, so opted out of the tasting and instead wandered the length of the town with another couple. 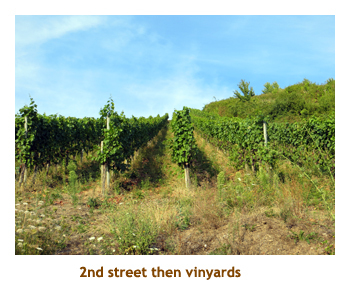 There were only two streets running the length of the town - one right along the river and one a block up the hill running along the vinyards. 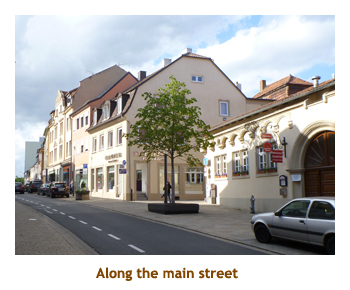 All the buildings were between these two streets. 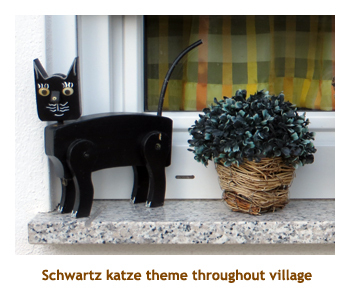 There was a black cat theme throughout the village, in honour of the main town winery called Schwartz Katz (Black Cat). 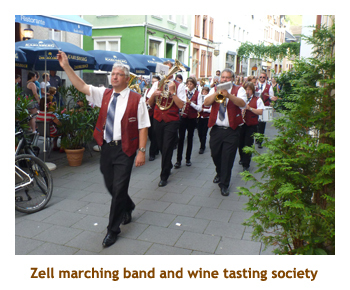 As we walked back to the main square, we ran into a small parade provided by the locals consisting of a marching band, followed by the wine queen and other dignitaries, in turn followed by our fellow passengers. What a tasting they had! We woke up at 6:30 to our final full day of the cruise and it was going to be hot. The forecast was for 33 degrees. We were still sailing from Zell to Trier (slowed down by lots of locks), and were expecting to arrive at Trier by 2:30 in the afternoon. 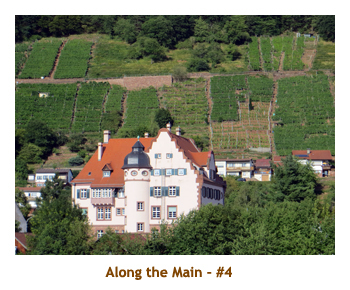 So, we settled down for a scenic trip along the Mosel. 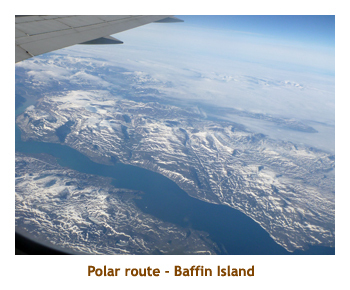 We alternated between the heat of the upper deck and the cool of the viewing lounge. Once again we were treated to villages, locks and vinyards. At 12:30 we went for lunch. All of the lunches were served buffet style, but with an optional menu for entree items. After lunch we watched as we docked in Trier. 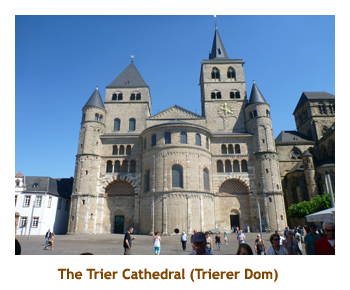 We braced ourselves for the heat and then headed ashore to be bused into Trier old town (about 2:30). 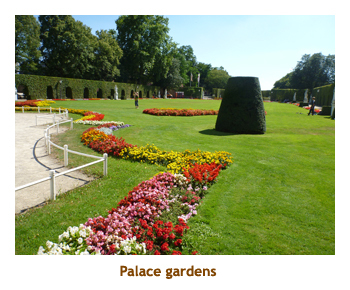 In Trier we walked through the old town area, stopping first at a royal palace and beautiful attached garden. 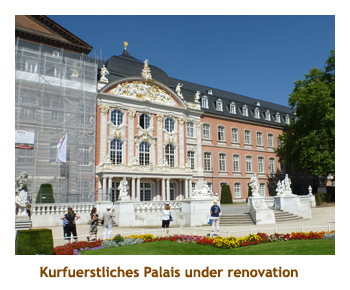 The palace was being renovated, so not all of the exterior was visible. 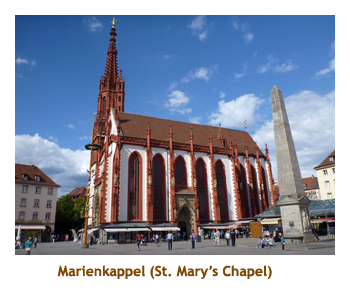 Then we proceeded to three huge churches almost adjoining one another, but from different eras. 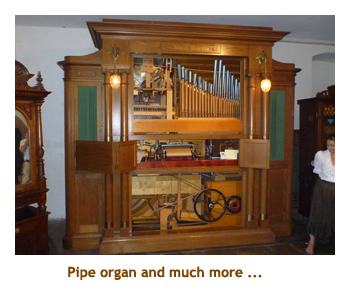 One was now Protestant and was very plain inside, whereas the others were very ornate. 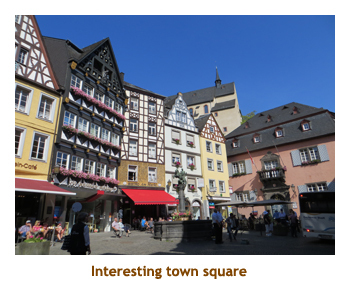 We ended the tour in the town square and were given free time to explore a bit. It was very hot out, so after doing the main street we sought shelter in a Euro store (analogous to our Loonie stores back home). At the end of the free time we gathered at the Black Gate to wait for the bus. We were bused back to the ship arriving about 6:00. We had our final dinner aboard (I forget what I had) and then packed our bags. We didn't have to put the bags out until the following morning. After a final walkabout, we headed for bed. We were up early, about 6:00 PM, put our bags out in the hallway, and headed for breakfast. I was going to miss my morning omelet! It was a cooler day and raining, but who cared, we were going home! We were docked in the Luxembourg village of Remich. Our bus left the ship about 9:00 and we drove to the airport, about half an hour away. We arrived in plenty of time to check in to our BA flight and go through security. Our first flight was a short hop to Heathrow. We had a 4 hour layover at LHR and then boarded our AC flight back to Calgary. Again we were ontime leaving LHR and looked to be into Calgary a few minutes early. Then we got an announcement that YYC was temporarily closed due to a wicked thunder storm / hail storm and we would have to circle for 45 minutes. When we finally landed (along with many other flights), we taxied to just short of the ramp and were told we would again be delayed until a ground crew could be freed up. We eventually hooked up to the ramp when we were told that the Customs area was full so there would be another delay. About 8:00 PM (1.5 hours late) we finally cleared Customs and the baggage area to find Ian and Shirley waiting to pick us up (bless them!). We were home just after 8:30. All was OK at home and our kitties were glad to see us. 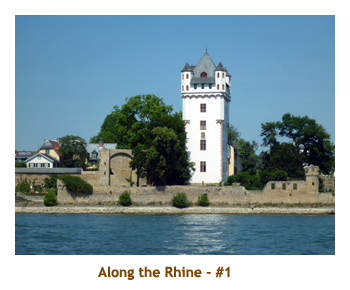 Here endith the diary of our Rhine/Mosel River cruise. 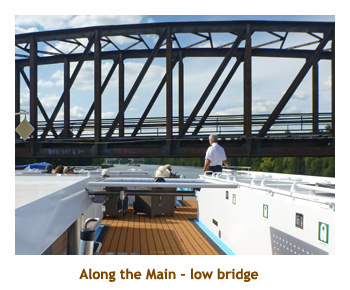 You can read about the rest of our trip in the diaries covering the first river cruise Lyon to Avignon, and the land trip from Avignon to Brussels.